Courtesy of Dr. Eilat Mazar; photo by Noga Cohen-Aloro. This amazing discovery is of immense proportions because it takes us back over 250 years prior to the time of King Hezekiah of Jerusalem. Dating back to the tenth century C.E. this shard is a valuable find as it reveals the ancient Hebrew script, with its Canaanite language, the oldest found in the city of Jerusalem. These incredible discoveries continue to prove the ancient history of the Jews in the land of Israel against the face of Islamic revisionism which seeks to twist history and deny any Jewish presence in the land. I would highly recommend you read the article by clicking on the link below. Enjoy! 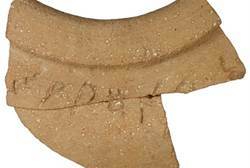 This entry was posted in Archaeology, Canaanite, Hebrew, Israel, Jews and tagged archaeology, Biblical Archaeology, Hezekiah, Islamic Revisionism, Israel, Jerusalem, Jews, shard. Bookmark the permalink.